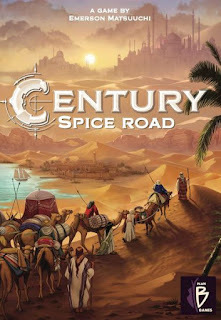 When Century: Spice Road came out, friends started to describe the game as some sort of a Splendor-killer. So naturally this piqued our curiosity enough to try it out and we came to appreciate the game. And while we didn't get the whole Splendor vibe that people were associating with the game, we still enjoyed the resulting play experience. While both games involve players being traders, the similarities rather end there as the gameplay is pretty distinct with a greater emphasis on working with the spices that you have in order to get the correct combinations. And since you need to find a way to trade up or trade down to get the right combination, there's a not of shuffling around that is unique to this game experience. I'm not a biggest fan of the design of this game in terms of how it supports the system (or doesn't always support) but the gameplay is worth playing through that sort of thing. So let's get this caravan going. 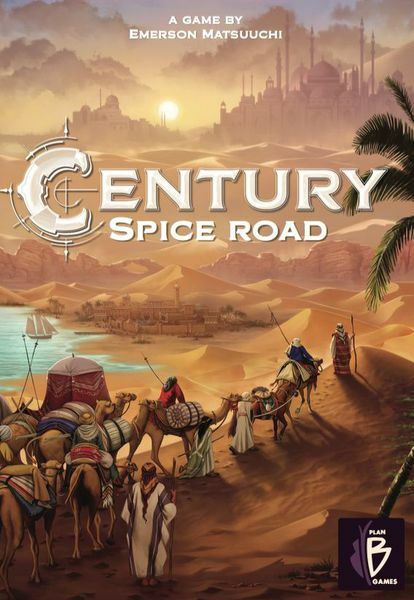 Overview: Century: Spice Road is a strategic card game designed by Emerson Matsuuchi. The game supports 2-5 players and has also been reimplemented as Century: Golem Edition. Players are caravan leaders who travel the silk road to trade spices and fulfilling demand. This is translated into four possible actions of which a player can do one each turn. They can establish a trade route by taking one of the market cards - but cards not at the end will cost spice. They can made a trade or harvest spices by playing a card from hand. They can rest and take back all cards played back into hand. And finally they can fulfill a demand by paying the right combination of spices to match a victory point card's requirements. There are some nuances to the game such as each player's caravan can only hold a combination of 10 spices in total. Spices follow a steady progression of levels starting with turmeric going all the way up to cinnamon. And while there are no direct ways for players to interact with one another, victory point cards are free-for-all and there's no way to reserve a card for yourself. What I Liked: The many elements that you need to balance in this game can get pretty insane and that's also where the fun is. The many different cards in the game seem to trigger almost random trade values between spices but it all works out if you get the right combination of cards. Limiting which cards can directly give new spices without trading along with cards that allow for universal upgrading of spices not limited by the combination on the cards makes for a lot of roundabout thinking. And I rather appreciate the decision to go with the cubes that they selected as they have a nice "feel" to them size-wise. Throw in the cute little plastic cups for holding the spices during the game make for a nice addition to the game's value. Throw in the rather pretty art and the high quality cards and it all ends up enhancing the experience. What Could Have Been Better: There are aspects to the design which are a little annoying to me. As beautiful as the metal coins are, there's something about the shades that they selected that makes them a little hard to distinguish in warm light. Then we get to the player boards, which are cards depicting the caravan. The card includes very intricate designs that show where you put the maximum 10 spices you can have but with the variety of the card art it's hard to see them markers a lot of times. And that's just weird design. The lack of a player interaction component isn't uncommon for games of this nature but I've had a few friends wishing there was a way to be a bit more aggressive as players. I don't mind all that much, but I do recognize that this makes the game another simultaneous solitaire game of sorts. TL;DR: Century: Spice Road is a clever game with a unique game experience that is distinct enough from the likes of Splendor. There's a similar tone of enjoyment but the way of thinking you'll need to get far with this game is pretty different. Thus the game gets a great 4 spice trade combinations out of a possible 5.